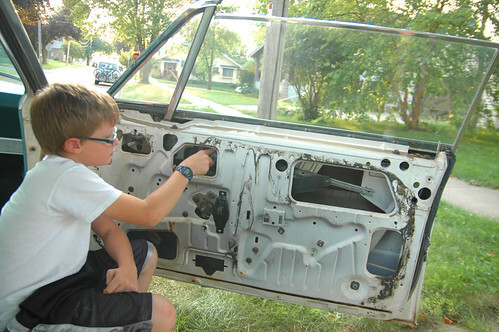 day 3335: odin helps with his first “big” repair on the galaxie 500! i can play a long game, but finally getting to being able to work on the galaxie with odin is one of the longest i’ve played. when he was barely a year old, i wondered about the day when he’d help me finish one of those projects that i’ve been always meaning to start. when we were taking a ride for the first time with his cousins we all noticed that the passenger side window was getting hard to roll down. aha! the perfect opportunity to clean up and grease the window regulator before it wears out and breaks. i know this because when i first got the car i ignored how hard it was to roll up and down the driver’s side door and stripped the teeth on the regulator ( you can see the window handle is off in this picture because i was trying to figure out how to get it to roll down ). i learned then that it’s much, much easier to clean and grease a regulator rather than try to track down a used one and replace it. 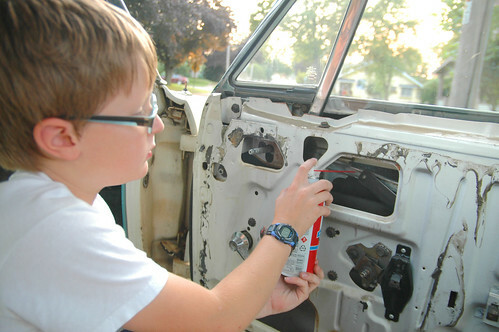 so, i showed odin how to take off the door panel and he was very excited to help out by using steel wool to scrape the ancient, hardened grease out of the “scissor arm” rails that roll the window up and down. after he cleaned out the rails i showed him where to spray a little white lithium grease on the rails around the rollers. then he rolled the window up and down the distribute the grease evenly. his eyes got big and he smiled a big smile when he saw,lo and behold, the window rolled up and down just like it would right off the factory floor! i think we’re going to have a whole lot of fun working together on the galaxie and someday down the road i know he’ll be proud of all the work we’ve done when i give him the keys.